Thanksgiving is a special time of the year for many people, and there are multiple different ways to celebrate it. Thanksgiving is nearly upon us, and if you haven't already considered what you want to do, there's no better time than now! Thanksgiving is one of the few holidays that doesn't mainly consist of receiving something. For Halloween you receive candy, for Christmas, you receive a variety of gifts, and for Easter, you receive a basket of goodies, but for Thanksgiving, you don't get any kind of gift, unless you consider the delicious food. It's mainly about getting together with your family and giving thanks. It is a holiday celebrated in multiple areas throughout the world, and in many different ways as well. First is the most obvious tradition and the one I personally love. The food! Thanksgiving is famous for it's huge, delicious meals of turkey, cranberry sauce, mashed potatoes, pumpkin pie, and many other courses that will cause you to fill your stomach until you feel like you're going to blow up. 2. "A Charlie Brown Thanksgiving"
Some people, my family included, watch "A Charlie Brown Thanksgiving" every year without fault. It's the perfect short movie that is filled with family fun and humor for all ages. 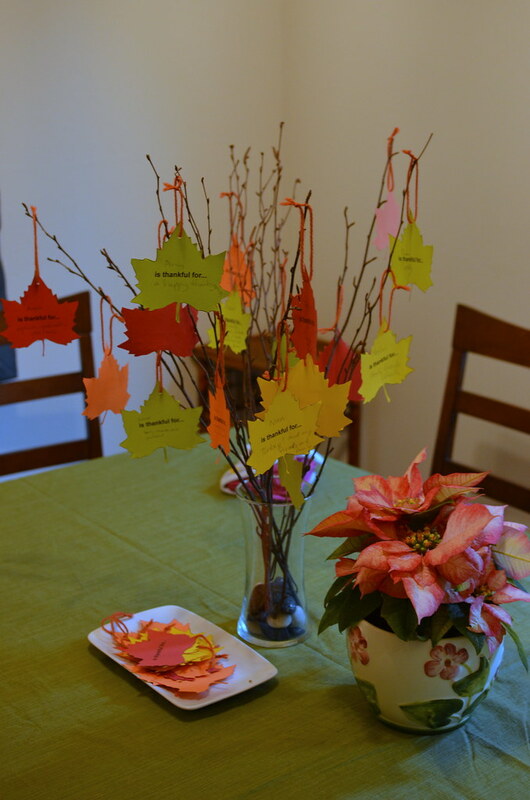 One really sweet tradition that is not only great for kids, but also for anybody willing to do it is a Thanksgiving/thankfulness tree. 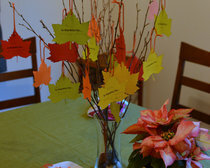 This is where you take some branches, put them in a vase or something of that sort, cut colorful paper into the shape of leaves, write something you're thankful for on each "leaf", and attach it to the branches. It's a good way to remind yourself of what there is to be thankful for in a fun, creative way. Family gatherings is another one of the most popular ways to celebrate Thanksgiving. It makes the holiday much more cheerful and fulfilling, as well as the fact that it causes there to be a reason for a larger variety of food. A nice tradition that is sometimes performed on Thanksgiving is when a family will sit at the dining table after grabbing their serving of food, and once everyone has gotten comfortable they will go around the table each saying at least one thing they are thankful for. Not only is this a fitting tradition for the holiday due to its namesake, but it also can lead to good stories and a table full of laughs. While it may not be the most common tradition, some people will do a tailgate thanksgiving. It's a great way to still spend time with those you care about and get the Thanksgiving football experience. You can even still get a Thanksgiving dinner if you plan ahead. What some people will do is make the food at home, pack it up in some Tupperware or something like that, and then will take it out and heat it up on Thanksgiving. I know at least a few people plan to spend their Thanksgiving like this for the Apple Cup between WSU and UW this year. If you don't know how to cook, don't enjoy cooking, or just don't want to spend hours making the extravagant meal, there is always take-out! It still tastes plenty good and you have more time to enjoy yourself. Spending Thanksgiving with family is a rewarding experience, but so is spending it with friends. As the name implies, Friendsgiving is where you spend Thanksgiving with your friends. Of course, you can still spend it with your family by doing Friendsgiving the day before or after as well. There are multiple fun traditions that all have their own benefits. I highly recommend spending your Thanksgiving in a few of these ways. Not only will it be a new experience, but it will also be a memory you'll never forget.